Pregnancy affects just about every aspect of your life, including your oral health. There are many myths surrounding the increased risk of tooth loss because the baby draws calcium from the woman’s body, but they are not factual. That said, pregnant women are more prone to dental problems because of the surge in estrogen and progesterone hormones, which are claimed to exaggerate the response of gum tissue to plaque. What dental problems are pregnant women prone to? Without proper oral hygiene, including professional cleaning to remove plaque and tartar, pregnancy can cause gum disease, which is characterized by red, tender, swollen gums that bleed easily even with light brushing. This condition is referred to as pregnancy gingivitis, and affects most pregnant women to some extent. The symptoms can start to show as early as the second month of pregnancy. It should be treated immediately to keep it from advancing to the more serious form known as periodontitis. Besides gum disease, pregnant women are also prone to developing pregnancy tumors, which are non-cancerous inflammations that develop due to irritation of swollen gums. In most cases, the tumors shrink on their own after delivery; but if they feel uncomfortable and interfere with your eating habits, brushing, and other oral care procedures, you may ask your dentist to remove them. There are studies that show a correlation between gingivitis and preterm, low-birthweight babies. This is because punctured gums can allow bacteria from your mouth to get into the bloodstream, from where they can travel to the uterus. In the womb, they can trigger the release of prostaglandins that are claimed to induce premature labor. See related article: Can You Visit the Dentist While Pregnant? The best way to prevent gingivitis during pregnancy is by keeping your teeth and gums clean, with particular focus on the gum line. Brush your teeth twice a day and floss at least once a day. For some women, brushing triggers morning sickness. If this happens, rinse your mouth with fluoride and antiplaque mouthwashes. It is also important to maintain a healthy diet that is high in vitamin C and B12, which strengthen your oral cavity and keep your mouth healthy. 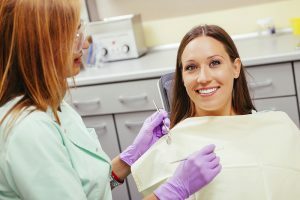 Regular professional cleanings can also help reduce the risk of gum disease, gum irritation, and pregnancy tumors. Non-emergency dental procedures can be performed at any point during the pregnancy. But in the event of a dental emergency that requires anesthesia or a prescription, you should consult your obstetrician first.